When is Christmas? Oh, I know it’s on December 25th. I know it’s soon, but when is it Christmas for you? The truth is, that old saying is a direct quote from Jesus as written in the book of Acts 20:35. It is more blessed to give than to receive, and deep in our hearts we know giving is first an attitude of the heart. For some, a giving spirit seems to be part of their DNA, where others have to be reminded because it doesn’t come naturally to them. So I ask you? When is Christmas for you? Christmas isn’t Christmas till it happens in your heart. We all know how to give from our possessions and give back of ourselves. We feel good when we have helped someone else feel good. Think about the last week. Without dwelling too intently on the subject, you can probably think of a number of things you have given away. At the grocery store you may have contributed to a food pantry. You said yes when the cashier at the dollar store asked if you would like to donate a toy to a military family. At the gas station maybe you dropped your change into a container where money is being collected for a community member who needs medical care. You baked and shared. You put in extra money when the offering plate was passed at church. You threw a few dollars into the Salvation Army Red Kettle, maybe more than once. Your list could be exhaustive – it could reflect your exhaustion with giving. So that’s why I don’t want to dwell on giving material things. For now, set all that aside and think about giving that comes from the heart. Wait! Isn’t that what we were just discussing? Giving is an attitude of the heart. Yes, yes it is. But in all the giving of things we can touch and feel, God has something even more important for us to give. 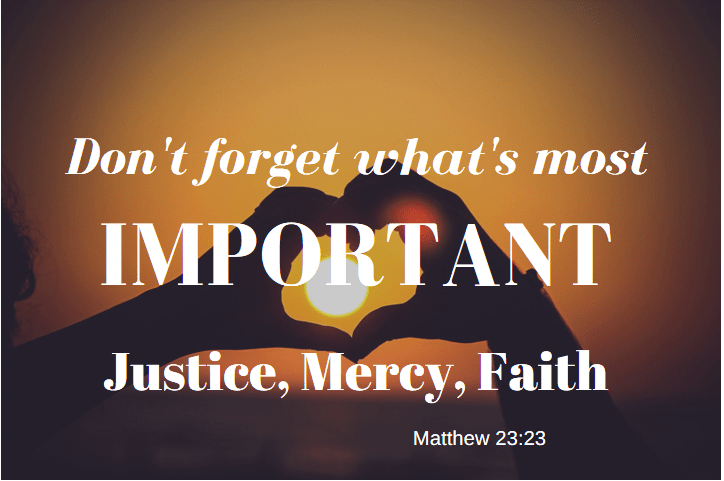 In Matthew 23:23 Jesus sternly spoke to people about being good about giving money away but they were failing miserably at giving justice, mercy, and faithfulness. Jesus leveled their attitudes and called them out for their motives. Early in the chapter, Jesus warns people about following leaders who had knowledge but were bad examples. People have needs. People need each other. We are all people. Keep giving. Keep helping. Keep loving. In our giving and helping and loving from our abundance, let’s remember to share abundantly from our hearts with justice, mercy, and faith. Let’s think before we post or speak. Listen at heart level, accept people for who they are, and be kind. Treat others the way you want to be treated. Smile. If you see someone without a smile, share yours. Be a friend. Tell someone they matter. Christmas isn’t Christmas till it happens in your heart. This is a song I learned when my kids were very young. It touched my heart deeply then and I believe it today. Christmas is a date on the calendar, it’s a holiday many people claims as their favorite, it’s a season, it’s a story, it’s family, it’s friends – but Christmas is more than that. It’s the birth of Jesus, the Messiah, the savior. And Christmas isn’t Christmas till it happens in your heart. Listen here. Great reminder of what’s most important at this time of the year. Thanks and have a meaningful and merry Christmas. Thank you for your kind words, Karen. I hope your Christmas was full of wonderful memories.